1466 slumbers in summer Sunday sunlight at Didcot running shed, 2017. Picture courtesy of and copyright Shaun Curtis. 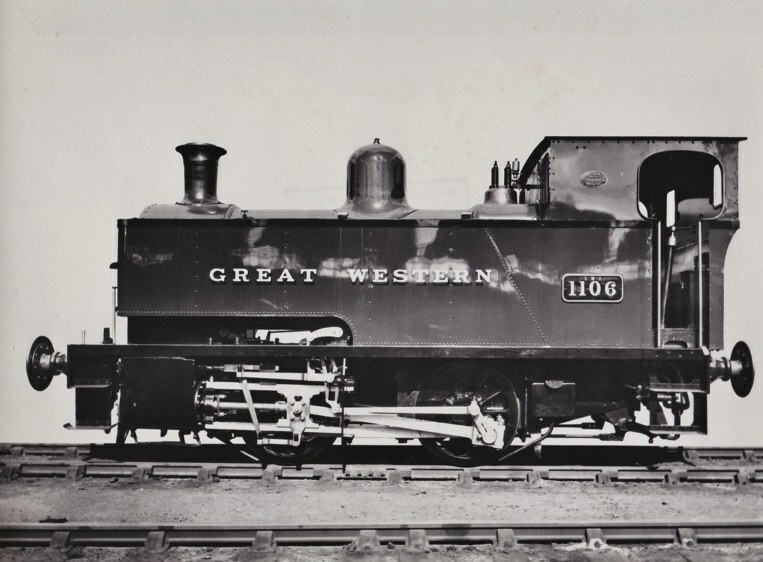 The GWR had 0-4-2 Tanks amongst its very earliest narrow gauge locomotives, and they existed in great variety and experienced many rebuilds and changes. An article of this nature cannot hope to capture all the detail. The intention of this paper is to provide an introduction to the main types that survived in numbers into the 20th century. It does not claim to be in anyway comprehensive: for that you need the specialist books on the subject: notably the RCTS series 1. Perhaps more than any other classes the 4-coupled tanks show the alternate Swindon and Wolverhampton lines of development and maintenance of the 19th century. There were two classes built in large numbers: the 0-4-2 517 class and the slightly larger 2-4-0 Metro Class. The 517s were designed and built at Wolverhampton, and the Metros at Swindon, but both factories would repair and rebuild both classes. It's striking just how independent the Wolverhampton factory was from the nominal head office at Swindon in the 19th century, and to a lesser extent up to the 1930s. It's quite clear that they maintained separate design teams and that they didn't even maintain common drawings for the same class, so Swindon rebuilds of 517s could be readily distinguished from Wolverhampton ones. When William Dean took over at Swindon he had been promoted over the head of his old boss, George Armstrong at Wolverhampton, and until Armstrong retired in 1897 he seems to have been left in complete charge at his own works without supervision by Dean. 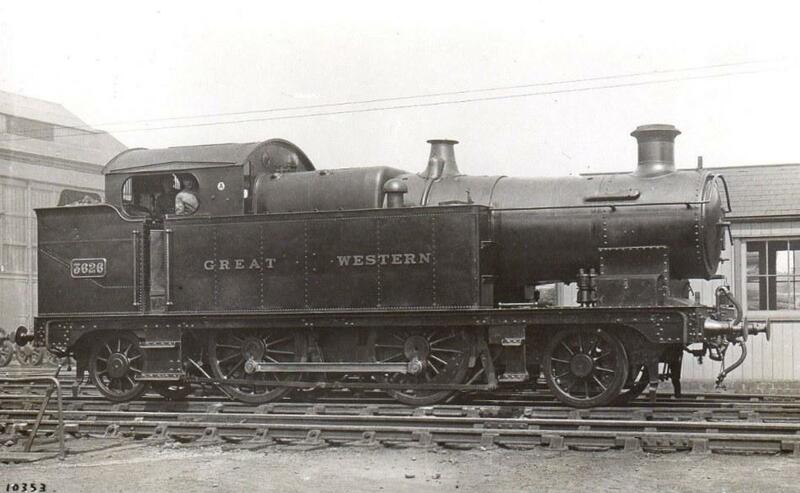 When a major overhaul was due the Great Western would dismantle a locomotive virtually down to its component parts. The boiler in particular would take longer to repair than the rest of the locomotive, so by the beginning of the 20th century an alternative boiler would be fitted as soon as the rest of the locomotive was ready in order to bring the locomotive back into service. Over the Armstrong/Dean/Churchward era, all classes, but particularly these small tanks and to a lesser extent the 0-6-0 classes had steady design improvement going on. It also seems clear that the policy was to update older stock as and when they came into the shops for repairs, rather than institute a programme to rebuild a whole class. The degree of rebuild that a locomotive might receive in the works seems to have varied greatly. One may speculate that it depended on how busy the works in question was when a locomotive came in for repair and how desperately it was needed back in traffic. 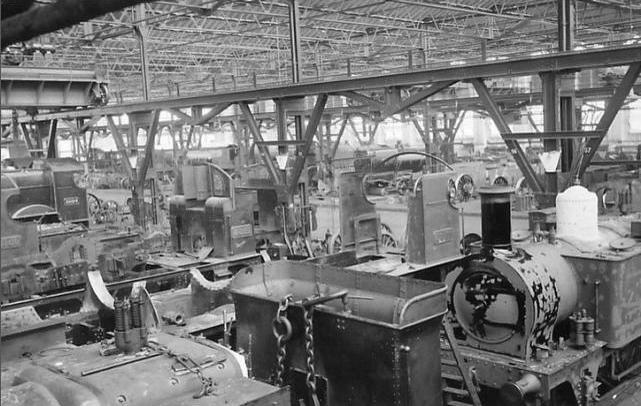 Some equipment, notably autofitting gear and condensing apparatus, was only required on some members of these classes and could be readily removed or added. It is evident that there was no particular pattern about which locomotives it was fitted to: locomotives were just equipped as convenient and might come into the works with the equipment and go out without. This policy appears to have changed with Collett as CME and Cook as head of Swindon Works. In their era specialist subclasses were maintained: 4800/5800 and 6400/7400 with and without autofitting are examples, as are the sub-class of condensing-equipped 8750 large panniers, the steam brake only 6700 and 6750 sub-classes and the renumbering of oil burning locos in 1948. C Std 3 10' 3" 5' 0" 7' 0"
P 2301 10' 3" 4' 5" 5' 4"
R 850 10' 0" 3' 10" 4' 0"
S 517 10' 0" 3' 10" 4' 6"
SS 4800 10' 0" 3' 10" 4' 6"
T Metro 10' 6" 4' 3" 5' 1"
U 2021 10' 0" 3' 10" 5' 0"
The RCTS volume on GWR 4-coupled tanks lists nearly 70 variations in boilers used on the classes mentioned in this piece. However, for our purposes we can list 7 basic classes of boiler used on them. Boilers seem to have been the subject of continuous development, especially during the Churchward era. Some of these early 4-coupled tanks, predating any kind of standardisation, had very long lives, even lasting into the Collett era. Two basic 0-4-2 saddle tanks, 91 & 92, were built by Beyer Peacock in 1857 and in 1877/8 one good one, 92, was made from the two. 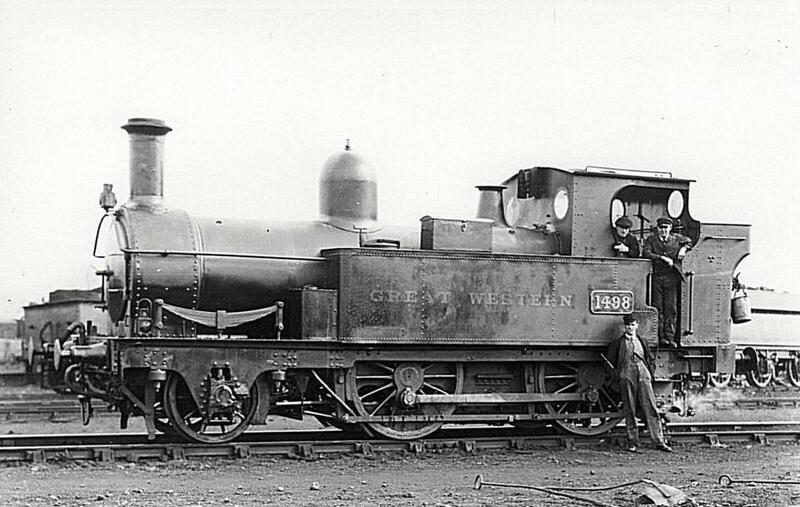 It was rebuilt as an 0-4-0ST in 1878, and in 1893 received a very major rebuild at Wolverhampton. Astonishingly it then survived until 1942, albeit only as a stationary engine in its latter years. 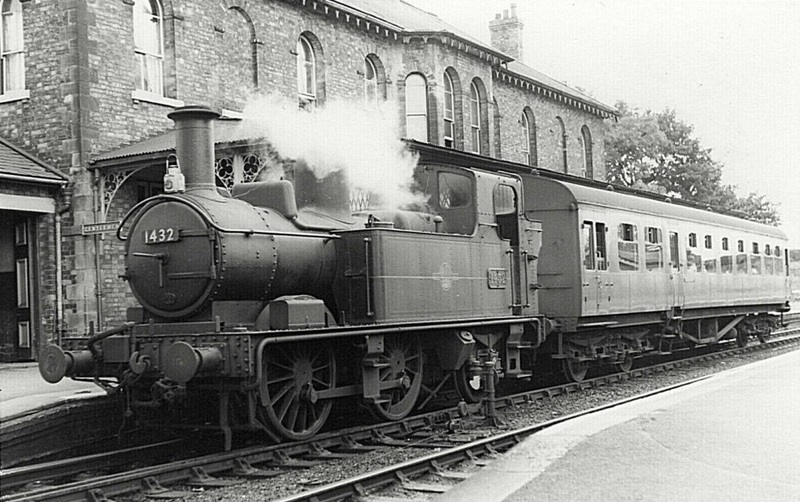 A similar loco, 342, was built by Beyer Peacock in 1856, and bought by the GWR in 1864. This had a similar life to 92, converted to 0-4-0ST in 1881, rebuilt in 1897, and survived until 1931. 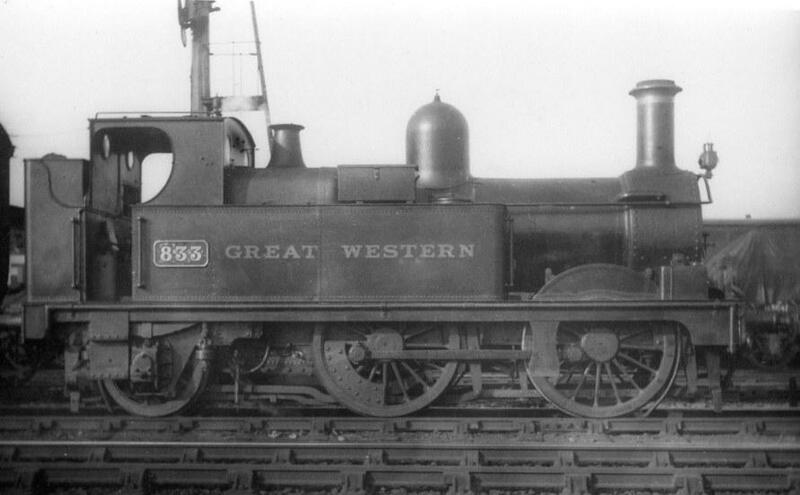 Wolverhampton built twelve 2-4-0Ts from 1864–1866. 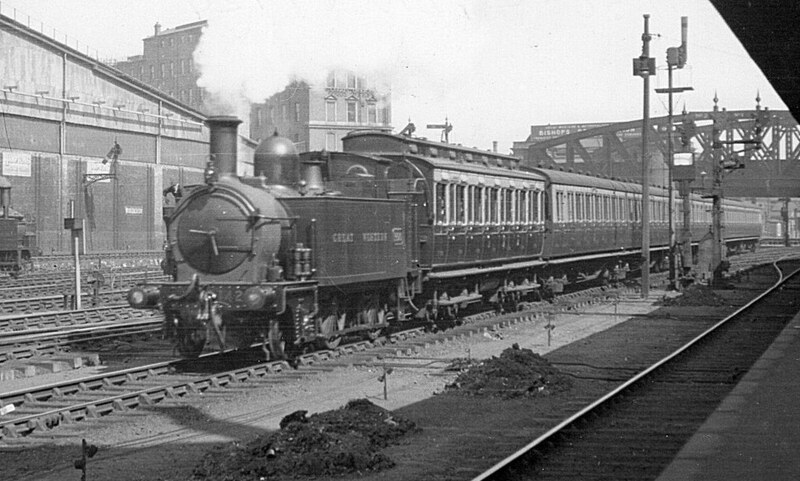 1002, 1A (soon 17) and 2A (soon 18) in 1864, then 1003, 11, 227 and 344–349 in 1865/6. 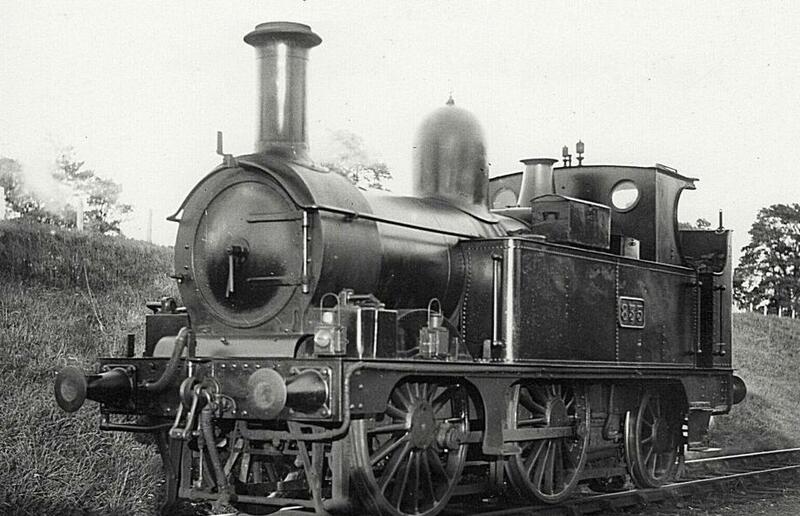 Much detail has been lost over the years, but they varied in both boiler size and wheelbase. As built they were cabless and had well tanks and a notably tall chimney on a low slung boiler, and later on acquired open cabs and saddle tanks. All went in the 1880s and 1890s. Swindon built two outside cylinder 2-4-0 Well tanks in 1864, 320 & 321. A Gooch design, they were the first standard gauge locomotives to be fitted with condensing gear on any line. They had steeply inclined outside cylinders and were very similar to the broad gauge "Metropolitan" class. 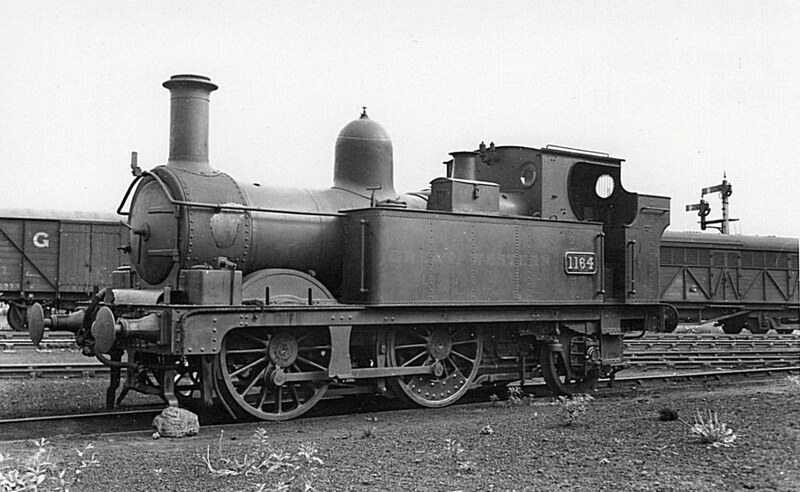 Wolverhampton built an 0-4-0ST, No 45 in 1880. 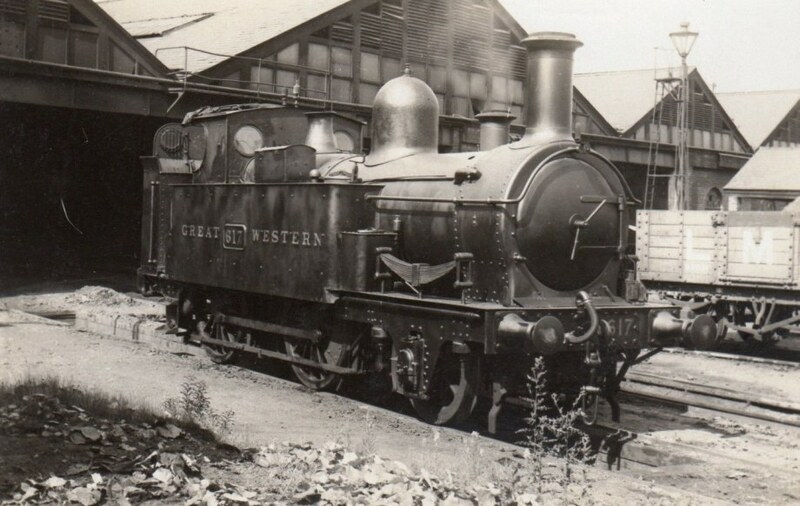 Noteworthy only for being the only conventional 0-4-0T built at any GWR works it was scrapped in 1938 yet ran only 430,000 miles in those 58 years. Several other small 4-coupled tanks were absorbed in the mid-19th century and were gone by the end of it. 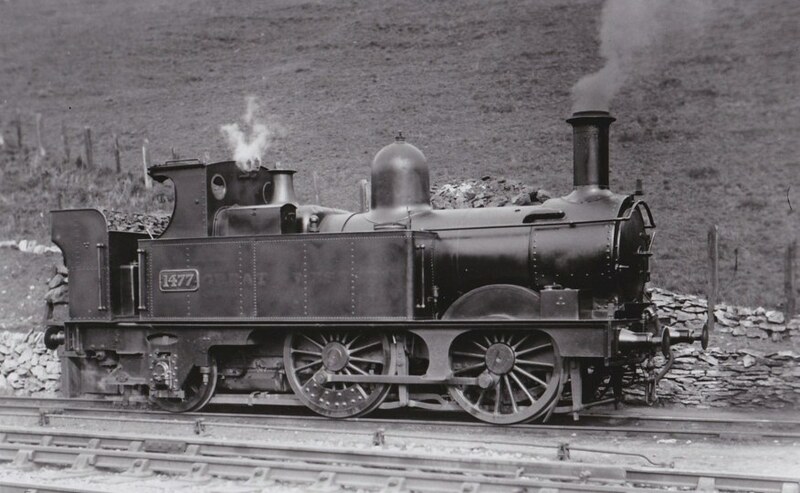 144 of the 0-4-2 517 class were built between 1868 and 1885. As might be expected with the GWR at that time, the last batches were significantly different from the first, indeed perhaps more so than most classes. As built the first ones were quite stylish but very Victorian looking saddle tanks, with small tanks that only covered the boiler barrel, so neither the firebox nor the smokebox. They had no enclosed cab or even a cab roof, only a "spectacle sheet" to give the crew a little shelter when running chimney first. They had a short (7' 4" + 6' 3") wheelbase, 5' 0" drivers, 3' 6" trailing wheels, 15" diameter cylinders and R class 140lb psi boilers. It can be gathered that there was little superficial resemblance between 1868 and 1885 batches. The 517 Class history is of almost unrivalled complexity – perhaps only the Metros approach them. Few 517s must have looked quite alike, and just about all of them changed radically in appearance over their lives – sometimes several times. Whole books could and probably have been written on the class history, and I don't propose to attempt another here. There are certain themes visible. 1876–1886. All the earlier short wheel base locomotives were converted to medium wheel base (MWB), still with inside bearings for the trailing axle. At the same time they were normally converted to side tanks. 1880–1883. Locomotives with 15" cylinders were given 16" diameter cylinders. 1870s/1880s. Open cabs were fitted to those without cabs, sometimes with and sometimes without spectacle plates on the bunker. 1883–1886. Some medium-wheelbase locomotives were converted to long wheelbase with outside trailing wheel bearings, with variations in detail design. 1890 onward. S Class boilers were introduced, and became the normal boiler for the class. 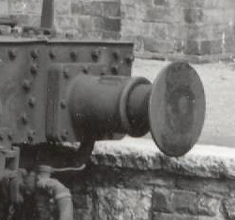 Few R class boilers were fitted after 1900. 1894–1902. U Class boilers were fitted on 11 locomotives, which kept them until withdrawal, making these almost equivalent to the 3571 class. 1891–5. A few medium-wheelbase locomotives were given longer frames, a bigger bunker and the S Class boiler. 1894–1915. Many medium-wheelbase (including conversions from short-wheelbase) locomotives were converted to long-wheelbase. Only 50 were never converted. 1896 on. Most received 16 ½" diameter cylinders. From about this date they started to be fitted with even thicker tyres on the wheels, bringing them up to 5' 2" and 3' 8". 1902–1923. A good number were given narrow closed cabs. 1904 on. Autofitting. Many of the class were autofitted. The locomotives with U class boilers don't seem to have been autofitted. I wouldn't guarantee this though. 1911 on. S and U class boilers with belpaire fireboxes started to be fitted. 1924 on. Further conversions to enclosed cabs were given a Collett style cab and bunker. By now these locomotives were starting to look very similar to their eventual successors, the 4800/5800 class. 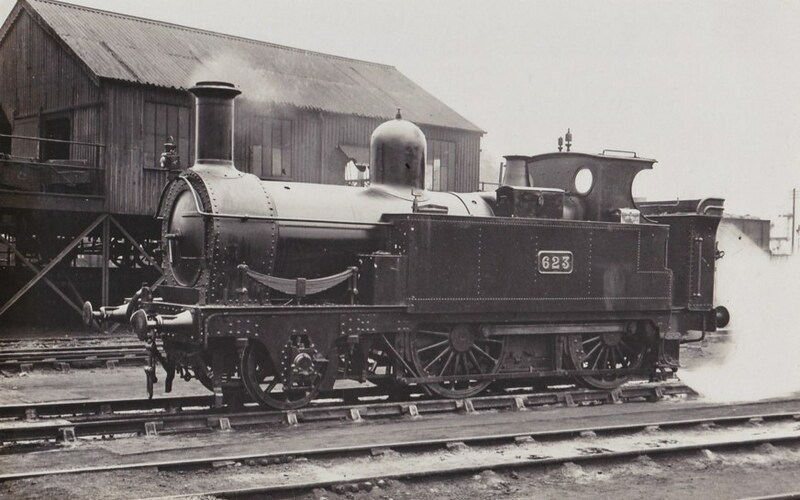 835, with a Belpaire firebox, original bunker, shallow valance, and tall thin chimney. At Faringdon, August 1926. 517 Class diagram L. This was termed a "Swindon" rebuild, and this is the final form, outwardly very similar to the 4800s. Bunkers were in a state of constant flux. They tended to get larger and Swindon, Wolverhampton and even Newton Abbott had their own designs. I don't propose to go into much detail: they were all different, and if you are proposing to model a 517 you need to pick your photo and see what it had at the date you are working to! Some boilers were fitted with top feeds. At the beginning of their lives the 517s were much used on suburban traffic, especially, as might be expected, in the northern areas of the GWR. Once autofitting came in the usage changed considerably, and they scattered all over the system. The autofitted locos were kept smart, and used mainly for the passenger work. Indeed at the beginning of the 20th century, when GWR carriages had a lake finish, not brown and cream, quite a number of 517s were painted the same colour. Two 517s were even encased in dummy bodywork to make them better match the rest of the train. A little sideline on the Victorian psyche is that in 1896, when a Royal train was required to traverse the Woodstock branch, 517 1473 was given the name "Fair Rosamund". "Fair" Rosamund Clifford was a mistress of Henry II who was reputed to have lived at Woodstock. The locomotive kept the name and worked on the Woodstock branch for many years. One was scrapped as early as 1904. A few went in the 1910s, but the majority went from the late twenties to the late thirties, with just a handful surviving WW2 and none lasting to British Rail. 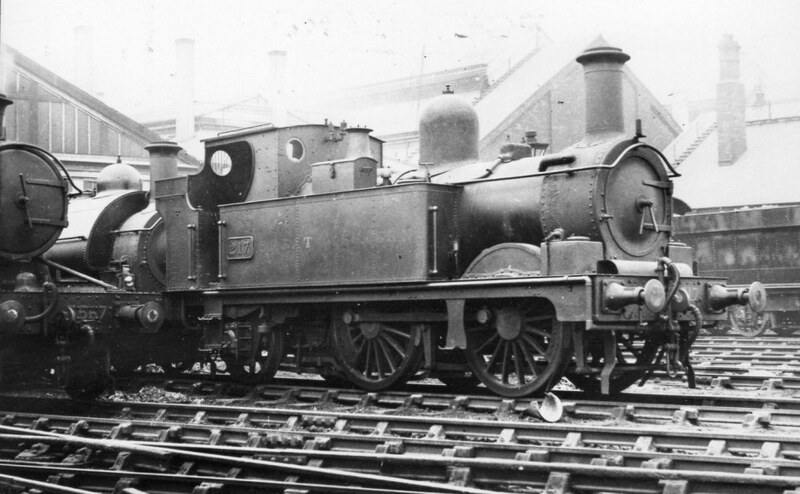 522, a short-wheelbase loco, shallow valance, round-top firebox, rebuilt with wide tanks and a Collett bunker. Some 517s never received Belpaire fireboxes. 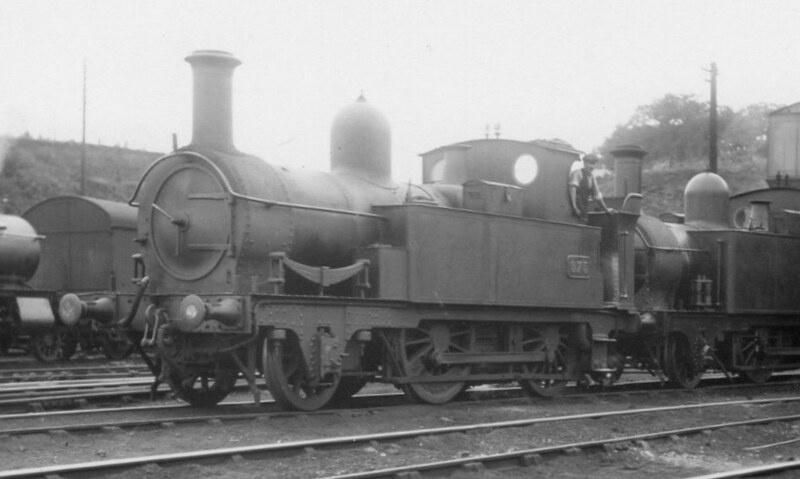 217 at Swindon, with a top-feed boiler, and what seems to be a roundtop firebox, and whistles mounted on the front of the cab. Wide tanks and Collett bunker. 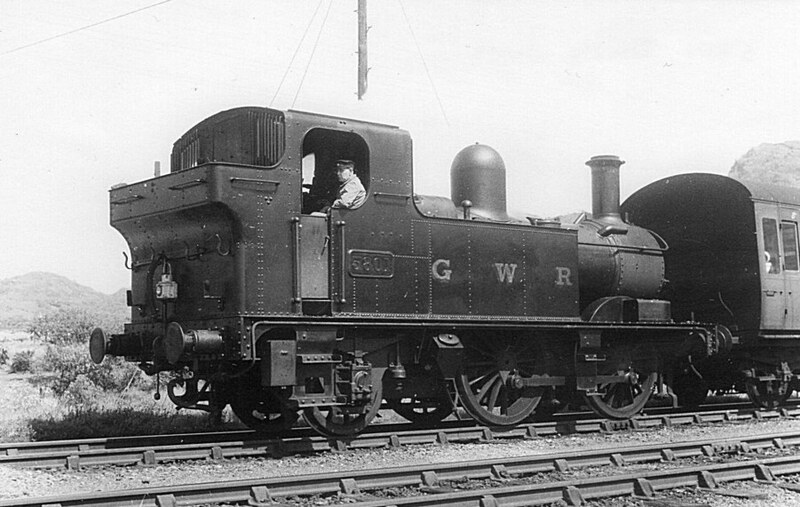 1164 at Oswestry, 7 June 1936, with wide tanks. It has acquired larger-diameter buffer heads. The short and unhappy history of the 3521 class as rather hopeless 0-4-2 tanks is dealt with in the 4-4-0 article. 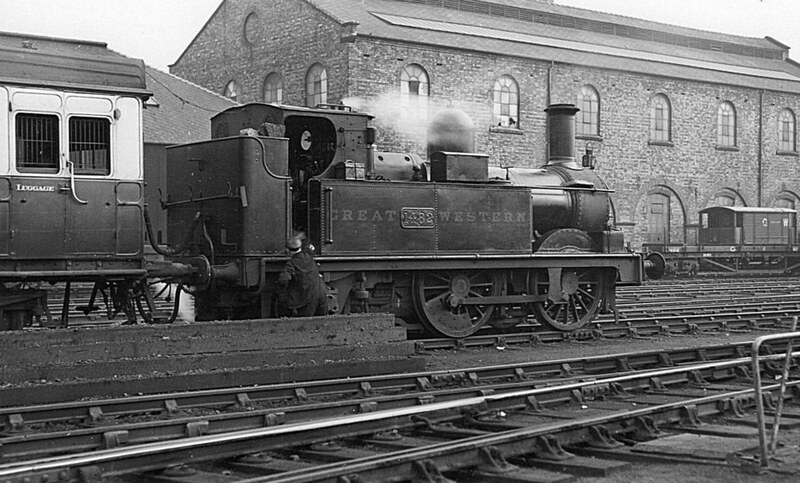 They had P Class (Dean Goods) boilers – larger than any other 0-4-2s, a 7' 6" + 10' 6" wheelbase and a reluctance to stay on the rails. Suffice to say that by the end of 1892 none was left running as an 0-4-2, and by 1903 all were 4-4-0 tender engines! See the 4-4-0 article for more details. Some good pictures of the class in their later years can be found on the Warwickshire Railways site. 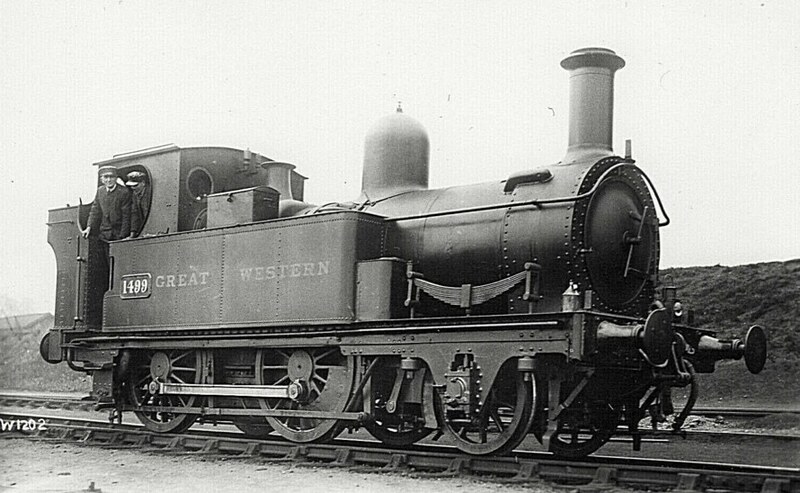 Just ten of these 0-4-2Ts were built in 1895–7. 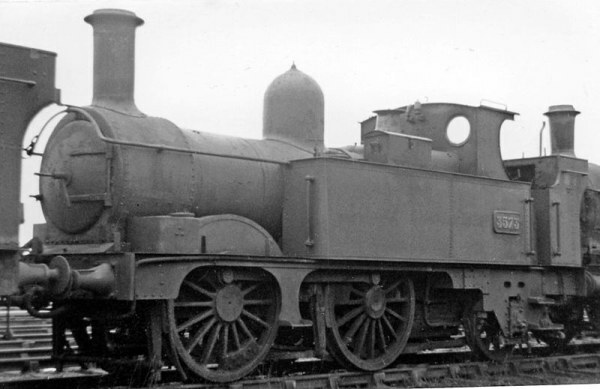 They can be considered to be an enlargement of the 517 class: they had a larger (U Class) boiler and different external framing for the trailing wheels. The wheelbase was 7' 4" + 8' 2", the same as the last of the 517s. These had a quiet life compared to the 517s. Belpaire fireboxes appeared from 1912. Various enlarged bunkers were fitted, and often rear spectacle plates on the bunkers. None were autofitted, and only one received an enclosed cab. Two went in 1928/9, but the rest survived into the 1940s. Three lasted until 1949 and British Railways, but by then do not seem to have been in use for revenue trains. The 2-4-0T "Metros" – short for Metropolitan as many worked over the Metropolitan Railway lines – did not exist in quite such variety as the 517 class, but it was perhaps a close run thing. They were built between 1869 and 1899, and some of the early ones were withdrawn as early as 1903/4. 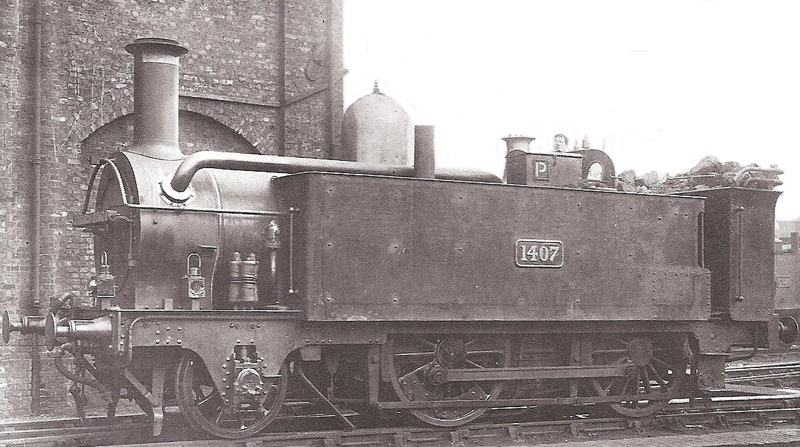 As well as the different wheel arrangement they had bigger boilers than the 517 class, and tended to be longer and heavier, although the ranges of weights overlapped slightly. The first lot of Metros, the 455–470 series, had 7' 3 + 8' wheelbase, 5' 0" drivers, 3' 6" leading wheels, 16" diameter cylinders, 740 gallon tanks and T class 140lb psi boilers. They had a rather odd footplate arrangement, swept down over the leading wheels from buffer height, up over the driving wheels, then back down to buffer height for the crew, who had no cab. Add to this a decidedly early looking flared chimney and as built they appeared to be very much an "early" locomotive. Partially conjectural drawing of one of the 455 series of Metros as built. Large Metro with condensing apparatus: a "Get Wet". 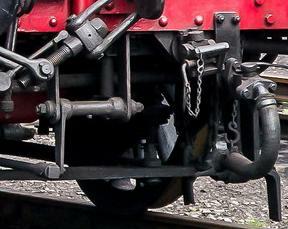 The front axles on the large Metros had volute springs. 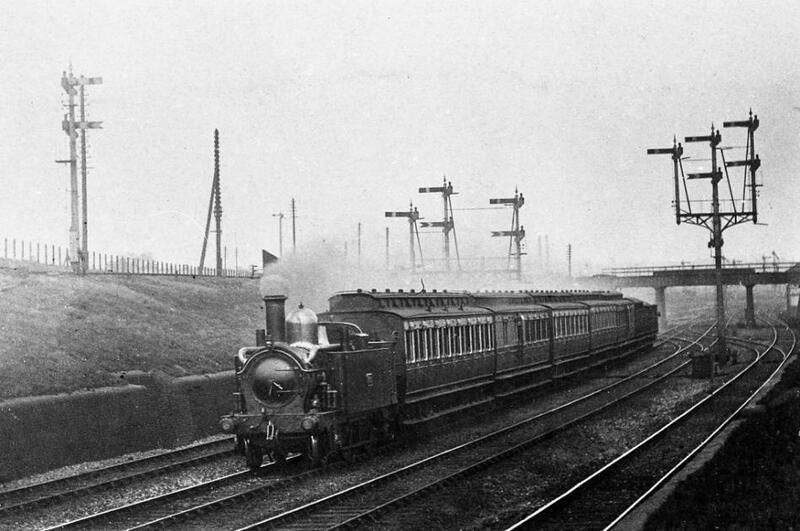 Large Metro tank 1411 with a long suburban train, c 1905. This engine has recently received larger tanks. A large Metro condenser tank purrs through Friars Junction on the down relief with a short train, a 4-coach set sandwiched by a strengthener all-3rd and a couple of vans, probably Siphons with empty churns. The Acton Wells branch rises away from the GWR mainline on the left, and the overbridge carries the North & South Western Junction Railway line between Willesden Junction and Kew. The arms on all the up signals shown here on the mainline are 5' long, and the distant arms are still painted red. Probably between 1903–1905. Metro tanks were common and very lively performers on Paddington suburban services. The first major changes affected the 455 and 613 series, which were rebuilt with straight running plates, and a 6" increase in the wheelbase between the leading wheels and the driving wheels. This left the 455s as 7' 9" + 8' and the 613s as 7' 9" + 8' 3". The 455s always retained this shorter wheelbase. Boilers started to be replaced in the normal course of things from late in the 19th century, but these were always variations on the T Class rather than different styles of boilers as happened in so many other classes. At the same time they normally gained larger tanks and various increases in bunker capacity. 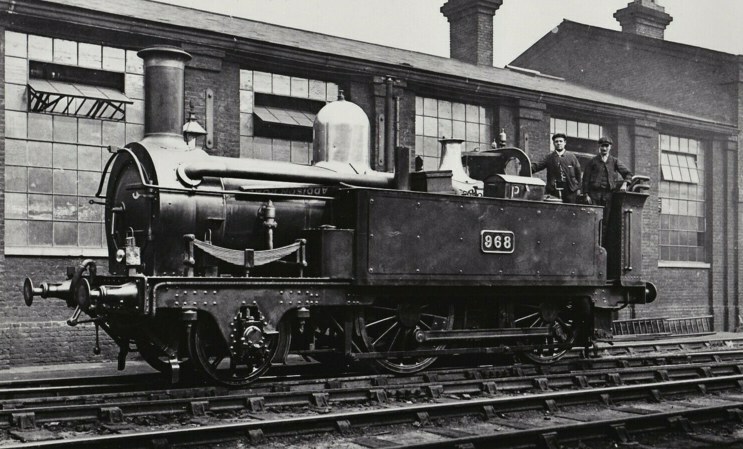 In 1898/9 30 of the engines with the medium sized tanks received larger 1080 gallon tanks and revised front springing to make place for them: they were then, with the 3581 series which was built shortly afterwards, known as Large Metros. So the Small Metros were those of the initial lot with the 3" shorter wheelbase, and Large Metros were those of the succeeding batches which carried 1080 gallon tanks and the nest of volute springs for the leading wheel suspension. Like all the other classes they received thicker tyres at the end of the 19th century, bringing the nominal wheel sizes up to 5' 2" and 3' 8". A complication with the Metros is condensing gear. Until electrification of the Metropolitan lines in 1903 the GWR maintained a fleet of about 50 locomotives with condensing gear for use on the underground – or at least subsurface – lines, the majority of which were Metro tanks. The gear seems to have been readily removable, and locomotives gained and lost the gear from time to time, and with it cabs, as locos with the condensing gear were normally cabless – sometimes known as the "get wets". The gear tended to be used on large engines with the 1100 gallon tanks once they were available, but there were exceptions in plenty. After electrification (c 1905) only about a dozen condensing locomotives were required, six of them large Metros (3567, 3568, 3570, 3586, 3591, and 3592), mainly to run freight trains to Smithfield Market. 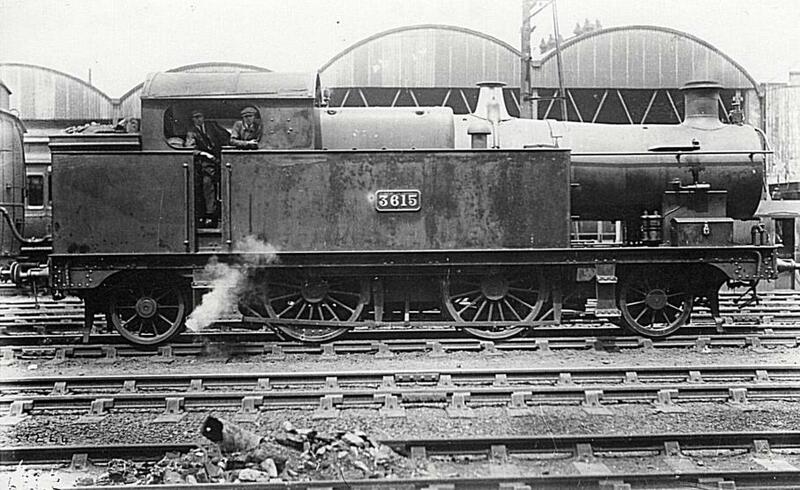 The other condensing-fitted locomotives were the 633 class 0-6-0Ts. 455 series (Small) Metro to diagram K. Belpaire boiler and open cab. There were also enclosed cabs. Large Metro in final form with enclosed cab and belpaire firebox. 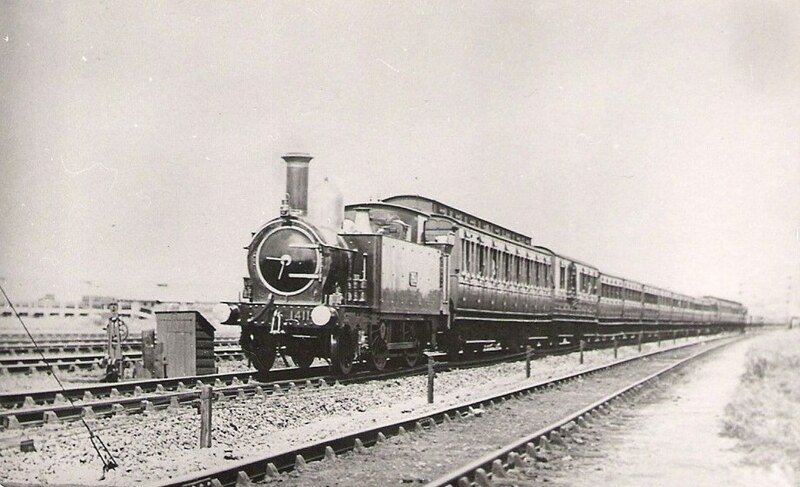 One locomotive, 3593, was converted to a 2-4-2 in 1905. It gained an enclosed cab and a very much enlarged bunker, but the experiment was not repeated. Belpaire fireboxes appeared from 1910. Yet larger bunkers appeared from this time, and the earlier engines at least received an 11" rearward extension of the frames to support a larger bunker, which later ones seem to have had from new. From 1924 Collett style bunkers with the overhanging extension at the top of the bunker appeared, as did (other than on condensing fitted locomotives) fully enclosed cabs. A great variety of shapes and sizes of bunker were fitted: there seems to have been no pattern at all. Around 40 were autofitted in the late twenties and early thirties, presumably to compensate for life expired 517s before the 48xx class were available. Non-condensing locomotives were extensively used on London area suburban services, but were also used on other branch and local work, mostly in the Southern division. They were also used on some quite fast main line trains – a Gloucester to Cardiff service for instance. Once autofitted they scattered even more widely. A few of the class were scrapped around 1905/8, presumably surplus to requirements after the Metropolitan electrification. A few started to go from 1928, but the majority ran into the 1930s when withdrawals started in earnest. Around 25 survived until after the war, all of them from the lots built after 1891, and ten large Metros from the last two lots built survived to British Railways. All were gone by 1950. 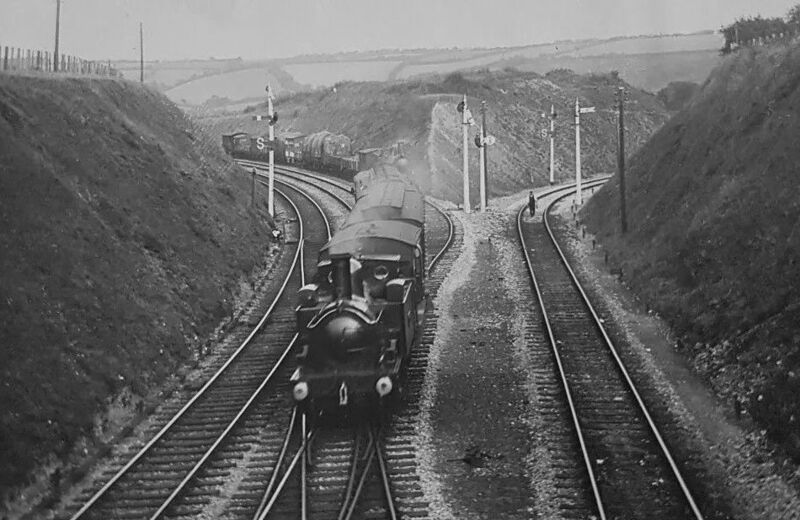 Overtaking a goods in the layback siding, a small Metro tank coasts into South Brent with a short down local train, c 1910. 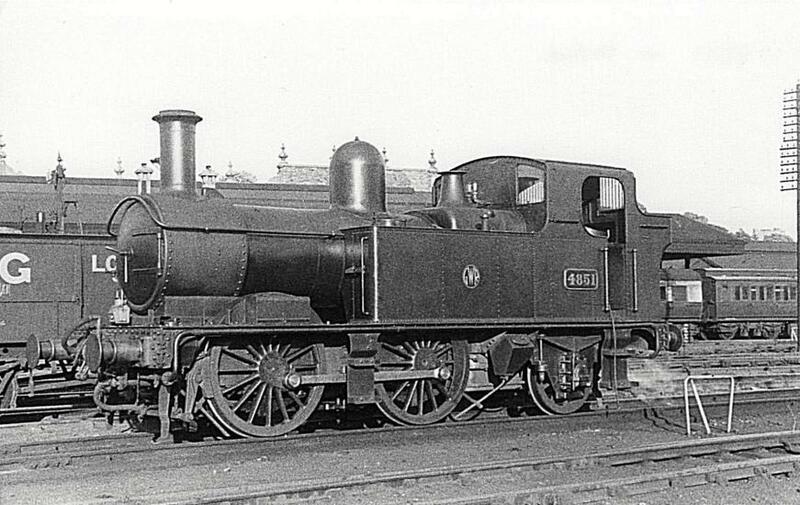 The loco is probably one of the early 455 class, because of the high tanks modification. The leading V2 4-wheel PBV has been converted to single-pipe gas lighting. Note the short distance between the distant on the down main and its home signal. The layback siding was later converted into a loop. Large Metro condenser 3586, fitted with tripcock gear for working into the suburban platforms at Paddington and trains to Smithfield Market. After removal of their condensing apparatus and receiving enclosed cabs, some of these ex-condensing locos were fitted with ATC to work the Fairford branch. Small Metro 975, with Churchward bunker, probably early to mid-1920s. A large Metro is behind 975. Small Metro 623, probably early to mid-1920s. Small Metro 459 at Swindon, probably late 1920s, with open cab and Collett bunker. Although its tanks are of the same length as other Small Metro locos, these are higher, giving it a greater water capacity. Resplendent after a major overhaul and repaint, large Metro 1417 at Swindon in 1926, with a closed cab, Collett bunker and a topfeed boiler. Its tripcock gear and nameboard brackets have been retained, indicating it is probably still earmarked for Paddington suburban services. Open-cab large Metro 1420, with its original bunker, and also with a top feed, takes a suburban out of Paddington. The train compromises a set of six 1925-built low-roofed articulated stock together with a strengthener 7-compartment all 3rd clerestory, possibly diagram C4, still with footboards on its 6'4" bogies. The 3-position electric semaphore is of US origin. 30 April 1927. Small Metros 1498, above, at Oxford on 9 April 1927, and 1499 in 1930. The closed cab and Collett bunker, and whistles moved to the front of the cab, are typical of the look of many of the locos in their last years. 1499 has acquired larger-diameter buffer heads. 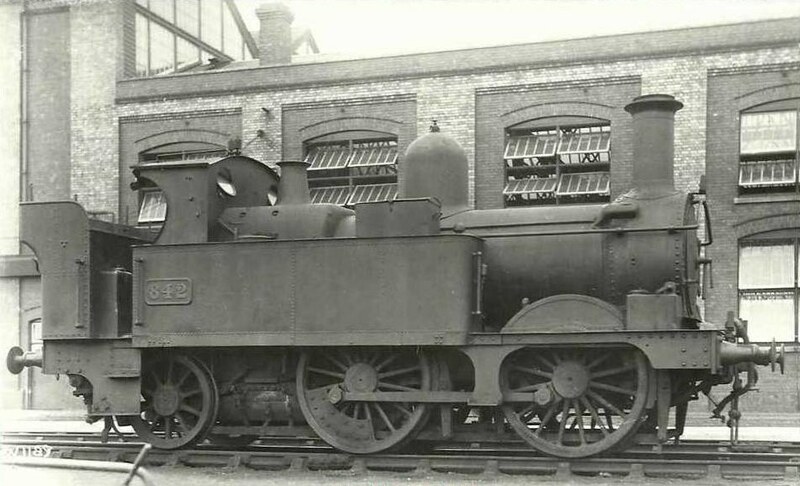 The 3511 2-4-0Ts were a tank engine version of the Stella Class 2-4-0s, presumably a part of Dean's standardisation exercises. They were a much larger engine than the Metros with 17" by 26" cylinders and Class P (Dean Goods) boilers. Originally they carried condensing apparatus for use in the Severn Tunnel. 3501–10 were similar, but built as convertibles for the broad gauge. The 3501s were all converted to tender engines, some whilst they were still running on the broad gauge. 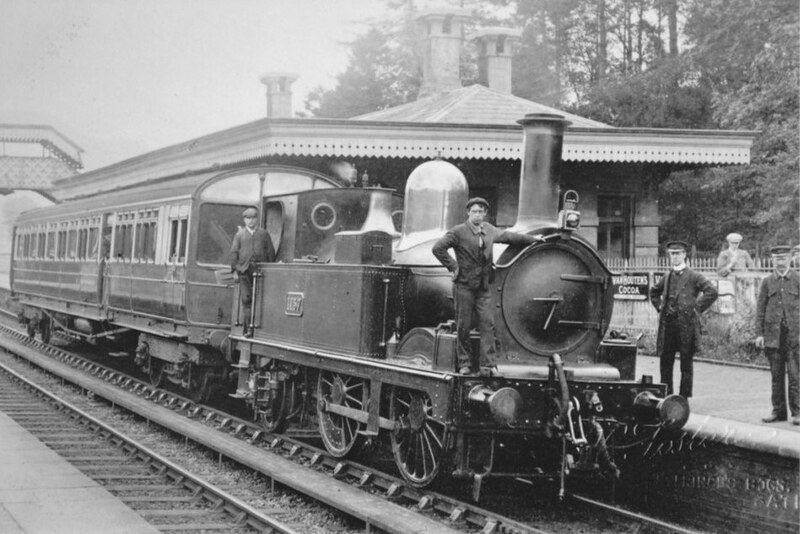 All were running as members of the 2-4-0 Stella class by 1892. 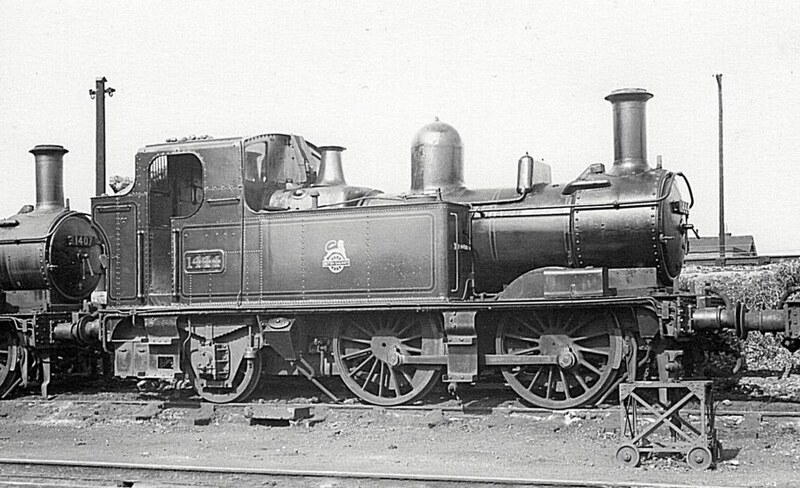 The 3511 series followed them into the Stella Class and lost tanks and gained tenders in 1894/5. Stella 2-4-0 3518 at Wellington shed, towards the end of its life, running with a 2500g tender. 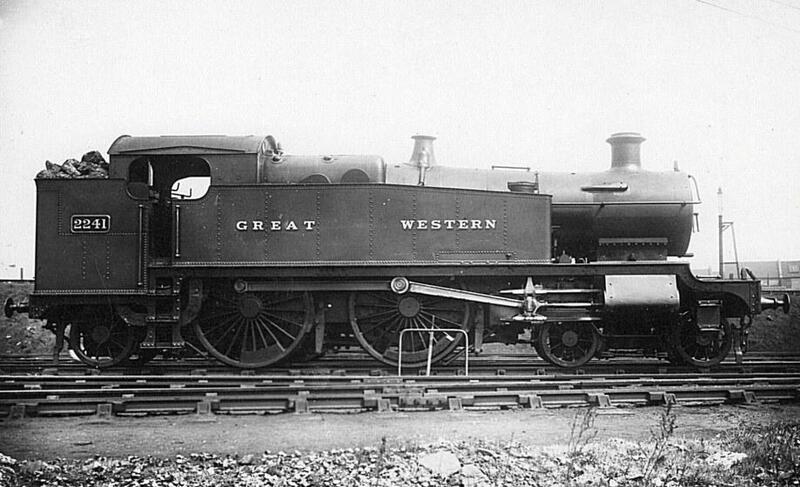 Even though the prototype was built under Dean's tenure these had a something of the look of the Churchward standard classes. They had many of the features that were to become characteristic of the standard classes, combined with others in common with the Aberdares and other classes from the end of the Dean era. 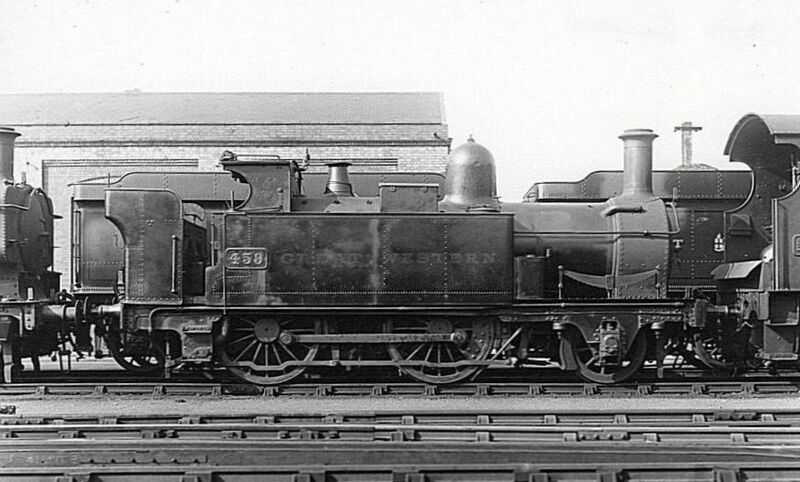 The later 56xx 0-6-2 tanks had quite a resemblance to the 36xx. A prototype, then numbered 11, was built in 1900 and thoroughly evaluated, and then batches, comprising 30 locomotives in total, were built in 1902/3. They had 5' 2" driving wheels – the Dean Goods size – and 3' 8" carrying wheels. 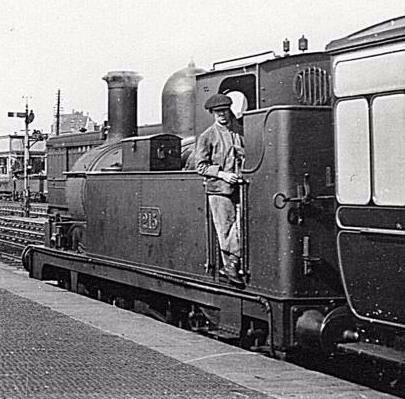 The locos had spacious cabs for their time, earning themselves the nickname of 'Birdcage tanks'. The prototype and the first production lot had parallel Std 3 boilers, but those from 3621 were built with taper Std 3s. 3600 Class to diagram H. This is one of the last batch when fitted with a superheated boiler. 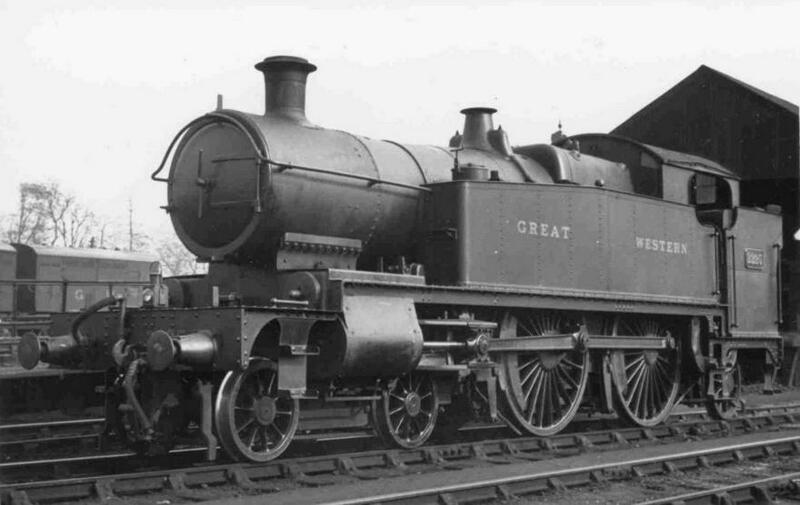 The prototype had a 3' 6" rear overhang, the first 20 4' 0", giving increased water capacity, and the last 10 4' 1", giving a further small increase in water capacity, there being a water tank under the coal in the bunker as with most of the large Churchward tank engines. They had bi-directional water pickup apparatus, causing what must have been an entertaining incident with the prototype when it picked up water far faster than the air vents in the tank could cope with and split the side tanks open! Thereafter they had much larger air vents. No 11 was renumbered 3600 in the 1912 renumbering. All those built with parallel boilers had taper boilers by 1915. The detail design of the boilers changed over the years as Churchward optimised the standard boiler designs. They gained superheating between 1912 and 1927. The earlier ones received larger (deeper) bunkers in time, but never the overhanging rear extension seen on most other classes. Surprisingly, for a class extensively used on suburban work, ATC fitting did not commence until 1928. They were withdrawn between 1930 and 1934, having been made redundant by the standard large 2-6-2 tanks on their normal suburban passenger work. 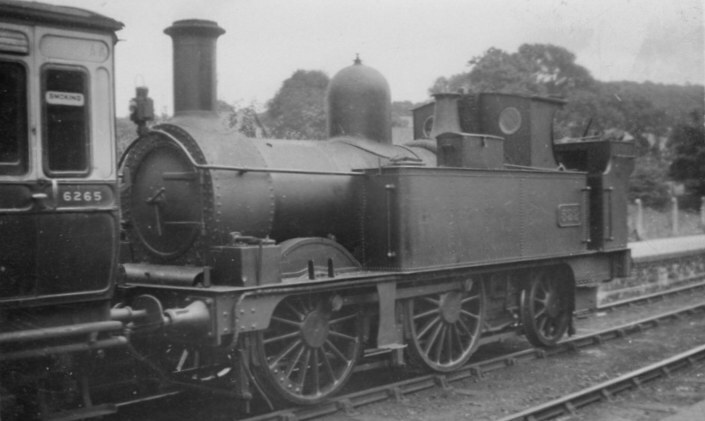 Built between 1905 and 1912 with Standard No 2 boilers, these were tank versions of the 4-4-0 Counties, and were therefore known as the 'County tanks'. The first two batches had square dropdown frames at the front, the third (and last) batch having the later curved style, and cylinders set lower. They were fitted with bi-directional water scoops. The only significant changes to the class were the fitting of superheaters and enlarged bunkers to the early locos, and the removal of the bogie brakes. The water scoop equipment was also eventually removed. Designed to replace the 3600 class tanks on suburban work, they had a reputation for rough riding like their 4-4-0 counterparts, and the acceleration from their large diameter driving wheels was not as good as the smaller-wheeled large Prairie tanks, which superseded and replaced them. 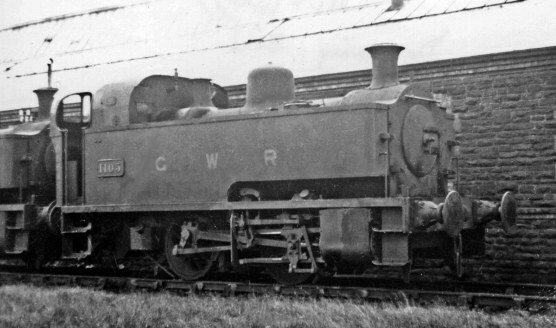 The last 2221 class loco was withdrawn in 1934. Six powerful and businesslike looking 0-4-0 side tanks ordered from Avonside of Bristol and delivered in 1926. 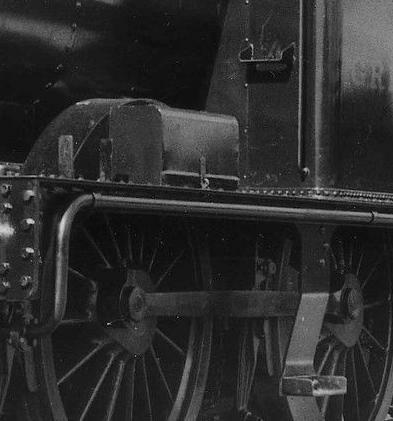 The side tanks were cut away at the front, and almost became pannier tanks. They were basically of a standard Avonside design – Cadbury's, for instance, had similar engines – with some small modifications for the GWR. The boilers were always the Avonside design and never replaced with a GWR type. The semi pannier tanks were certainly only on the GWR engines, and if I interpret the photos correctly, they had GWR directly loaded safety valves. 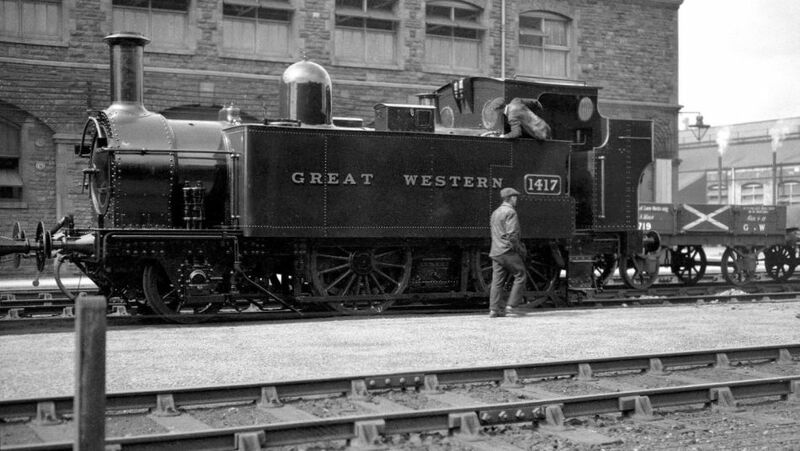 The 1101 had their cab roofs rounded off to improve clearances within a very few years of purchase, and gained GWR safety valve covers in the 1930s. Other than that they were little altered until withdrawn in 1959/60. None were preserved, but Cadbury's No 1, also built by Avonside and with the Birmingham Railway museum, is clearly a close relative. 1101 Class. I didn't locate a good drawing of the valve gear so this is partially conjectural. Modellers beware. 1105 at Danygraig Depot, 1946. Photo by Ben Brooksbank, and reproduced by Commons Licence. Click on the picture for a larger version. By the mid-20th century the 517s and Metros were wearing out and needed to be replaced. As with the light 0-6-0 tanks, the 4800 essentially followed the Wolverhampton lines of development. It was very much a case of taking a proven configuration and redesigning it using the best features of their predecessors in their fully developed state and adding all the latest engineering improvements for increased running time between overhauls and easier maintenance. Cook discusses the genesis of the 0-4-2Ts, along with their relatives the 54/64/74 classes in some detail in one of his books. The drawing office had a shopping list of mutually exclusive features including a desire to have leading and trailing wheels, even bogies, through light weight, good adhesion and low build and running costs. In the end they picked on almost exactly the same compromises as their predecessors of 50 years before. There were 75 4800 built between 1932 and 1936, with similar major dimensions to the ultimate long-wheelbase configuration of the 517 class. The boiler pressure was increased to 165psi, the cylinders reduced to 16", and the locomotives were fitted with generous sized cabs. The boiler, called the SS class, was very similar to the S Class, but with a drum head smokebox. All were autofitted. Collett is often criticised about the supposedly antiquated nature of the 4800s, but I've never seen a justification of this in engineering terms. From a business point of view using a 41-ton 6-wheel locomotive to haul one and two coach trains would appear to make far more sense than using a 63-ton ten-wheel locomotive as was done by other lines. The use of inside cylinders is also criticised, but I doubt that passengers would have relished the likely discomfort of being hauled by a short wheelbase outside cylinder 0-4-2. As with most Collett designs changes were few over their lifetime. 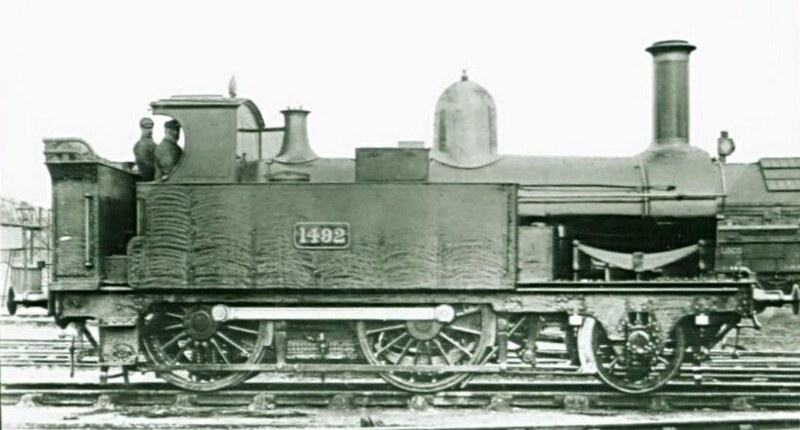 The last batch were fitted with whistle shields to divert steam from the whistle, and a larger pattern was eventually fitted to all of the class. Initially, locos were fitted with non-topfeed boilers, but the topfeeds and their characteristic tall casings soon replaced them. However, a number of non-topfeed boilers continued to exist, and locos could appear with either type after a visit to the works. Steps of the fireman's side of the bunker were gradually added, starting in 1936, topfeed was introduced from 1944, and apertures were made in the lower half of the cab steps. Toolbox position varied, either fitted central to the wheel splasher or in a slightly more forward position. In 1948 they were renumbered in the 1400 series, as the 4800 series was required for oil burning 2800. This of course saw many of them assuming numbers that had previously been used for the 517 class or for Metros. They started to be withdrawn from 1956 as branch lines were closed or DMUs took over light passenger traffic, and the last went out of service in 1964. 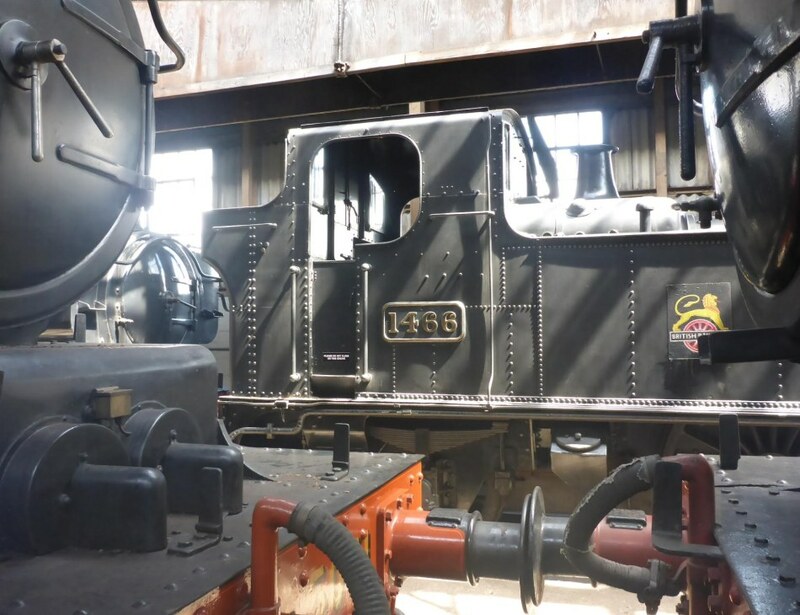 Four are preserved: 1466 (4866) is particularly notable as being the first locomotive bought by the nascent Great Western Society. Parallel-sided top feed casing. The covers for the lubricator and blower pipes from the boiler to the smokebox are separate. 1432 in lined green at Ellesmere, with a Hawksworth autotrailer, on the Wrexham shuttle. Probably 1957. 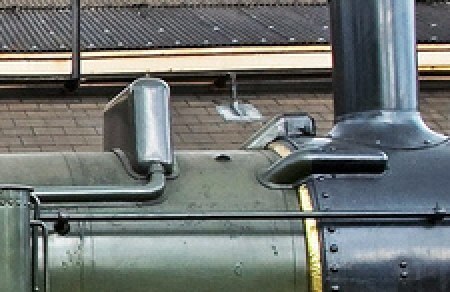 The loco has a belt seam on the tank. With a whistle shield and topfeed boiler, 1444 is in lined BR(W) green livery at Reading shed, 28 September 1958. Two battery boxes are fitted behind the rear step, one for the ATC in the loco cab, the other for feeding an autotrailer bell battery. The 19 members of the 5800 were essentially the same as the 4800, but not autofitted. This sub-class ran out of work rather earlier than the autofitted engines, and by 1954 six of them were in store, out of use, and the majority were withdrawn from 1957–1959, with one surviving until 1961. None have been preserved. (1) The Locomotives of the Great Western railway Part Six Four coupled Tank Engines, N J Allcock, F K Davies, H M Le Fleming, P J T Reed & F J Tabor, The Railway Correspondence and Travel Society. This is the primary source for this piece. (2) The Locomotives of the Great Western Railway Part One: Introductory Survey, N J Allcock, F K Davies, H M Le Fleming, P J T Reed & F J Tabor, The Railway Correspondence and Travel Society. (3) Swindon Steam 1921–1951, K J Cook, Ian Allan Ltd, 1974 0 7110 0511 7 p63 and on. (5) Cook, p85 and on. (6) Great Western Locomotive Design, a Critical Appreciation, Rev John C Gibson, David & Charles, 1984. ISBN 0-7153-8606-9 p31.